Waiting at the airport for family and friends to arrive is always fascinating – just observing human interaction and the mix of emotions as passengers wearily wander through the gates to be greeted is absorbing. Not so much fun when your daughter arrives after 40 hours of travelling and falls into your arms in tears! Lost baggage (or as American Airlines call it – “delayed”) with all the necessities of travelling on a boat for 3 weeks as well as Christmas presents, Nespresso pods, a copy the December Women’s Weekly, my new credit card plus the stress of not knowing when it will be reunited with her. It took 13 days to be exact and although some necessary retail therapy was had, it was overwhelmingly the inconvenience and frustration of dealing with American Airlines that tainted the start of her holiday. Jenny Moynihan – we are so thankful for everything you did to try and reunite them!! Jude and Skroo Turner also joined us in Antigua for a few days while on their way from New York to Vancouver. Yes, a bit out of the way, but it coincided with their 40th wedding anniversary (an amazing milestone). Will flew in the next day (with baggage) and our family was complete. Several delightful lunches and dinners later, normally washed down with copious amounts of wine, the Turners headed off to Vancouver and the snow to meet Matt and Jo for Christmas and we set sail for St Kitts and Nevis. Fishing, as we sailed along, was high on as Sal’s agenda of tick off items and she had a great deal of success catching barracuda. Sadly they are not considered safe eating in this area due to a nasty worm that lives in their gut, so we chose to throw them back but she still experienced the thrill of the catch. Will wrote and sang a song called “Sally and the Barracuda” which was most amusing! Once we were moored of St Kitts we noticed a rather large barra lurking under the boat – revenge we wondered? No one was keen to get in the water to find out!! A beautiful bay in St Barths was our next overnight just close enough to the main dining and shopping precinct for James and Sal to hop in the tender, “Winkle” and check out the scene. As you would expect, they thought they should partake of a cocktail or two and did so without checking out the currency first. Come the bill – insufficient funds…oops! Sal was held hostage at the bar (with an Aperol spritz in hand) while James returned to Miss Tiggy to redeem his credit card and return to the scene of the crime to pay up. 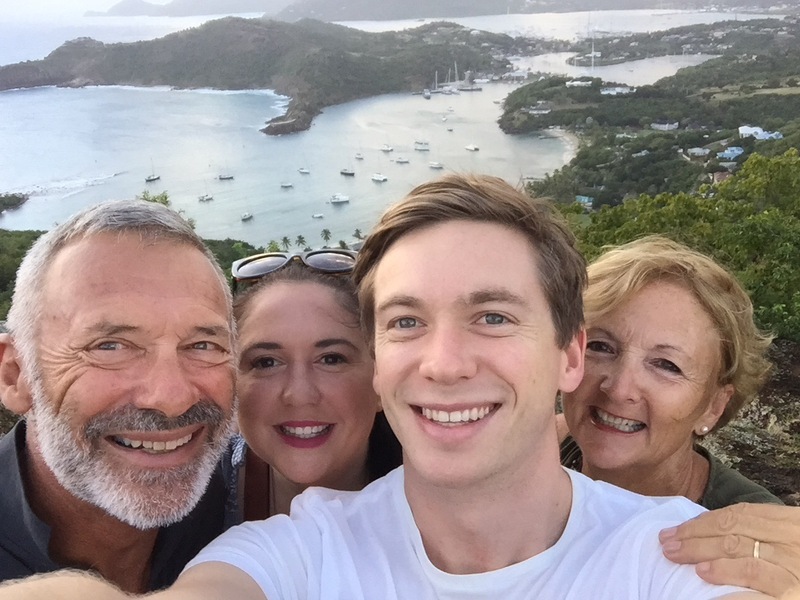 What did they learn from the experience – St Barts is very expensive! Anguilla was our chosen island for Christmas which was a great decision. We moored in a lovely cove called Crocus Bay with a white sandy beach (complete with free sun chairs, a beach bar, a jetty to tie the dinghy to and a restaurant) for the following 4 nights over the Christmas period. I had purchased a small Christmas tree and some fairy lights to decorate the boat in Antigua so there was a semblance of Christmas normality in our Yuletide celebrations. 25 December was a day of eating – breakfast and lunch were enjoyed at the local resort listening to a band whose singer was a tall dark and handsome ex-West Indian cricketer called Omari Banks. His claim to fame was 47 not out when the West Indies chased down a record 439 in the 4th innings to beat Australia. He also told James that Justin Langer was his first test wicket. I am not sure about his cricketing ability but he certainly was eye candy (Monique de Haan) and a great voice to match. Dinner was exceptional! A small restaurant located on a nearby beach called Barrell Stay and run by an English couple, Graham and Jill, was fabulous – not just the food, but the ambience and friendliness of the place was second to none. Jill (who would rival Nigella Lawson with her saucy food commenary and theatrical use of adjectives (lots of oozing and drizzling!)) was fun and outgoing and happily wandered around the restaurant all evening to ensure that the guests were having a great time! No problem there!! A marina in St Maarten (the Dutch half) gave us a chance to wash the boat and refill our water supply and was also a good base for an interesting couple of days. The marina bar called “Soggys” was very conveniently located about 50 meters from the boat and the barmaid would happily free pour the spirits, much to the joy of Sal and Will, so our first night was a bit hazy. Theo joined us from London at some ungodly hour of the night after his flight in a small twin engine commuter plane from St Kitts to St Maarten was delayed. Will is about to start a new job early in 2017, with the CAA (Civil Aviation Authority UK) and has long had a fascination for the airline industry. St Maarten is his nirvana! Maho Beach backs on to Princess Juliana Aiport (which is the major airport in this region of the Caribbean) and it is here that many people gather to watch commercial and privately owned planes take off and land only meters from the beach. The landing scenario was thrillng however I was not so keen on being blasted by the thrust exhaust of an Airbus or Boeing about to take off, much to the hilarity of my family. It was like having a sandpaper facial. Apparently the thrill is to hold on to the fence and see how long you can stand there before your hands are ripped from the structure. Not sure that is fun to me!! Our last stop before returning to Antigua – St Barths, clearly the island of choice of the Super Yacht brigade for New Years Eve. Moored approximately a kilometre from the main town it looks more like a parking lot for super sized boats than a delightful Carribean bay! We arrived in time for the NYE celebrations and rather than getting caught up into the melee of a night time celebration, Sal and I hit the shops, had our hair washed and blow dried at a salon and then met the boys for a late lunch….our plan to watch the fireworks (which we have been told will be spectacular) and have a few drinks on the boat. As I think the rest of the world has already reached 2017, all our best wishes for the year to come as we enter our last hours of 2016! “Miss Tiggy out”! Happy New Year Tig! I’m sitting waiting for the ferry on Bruny and have just been once again thoroughly entertained with your wonderful colourful writing!